Harmonix issued a statement in response to the collapse of its greatest competitor in the music genre, offering heartfelt condolences to those who've lost jobs. Usually, when a competitor stumbles or in this case completely falls apart, the company left behind has cause for celebration. Given the dire circumstances of music videogame genre as a whole, the guys behind Harmonix have no such plans, but they were still quick to comment on the demise of its greatest rival. John T. Drake, Manager of Communications at Harmonix, posted a statement on the company's forums regarding the news that Activision has shuttered its Guitar Hero division, wishing those now unemployed good luck, while making sure to point out that Rock Band is still going strong. Oh and by the way, Guitar Hero controllers work with Rock Band. Hint, hint. "We were sad to hear yesterday that Activision was discontinuing development on Guitar Hero. Our thoughts are with those who are losing their jobs, and we wish them the best of luck," the statement read. "The discontinuation of Guitar Hero is discouraging news for fans of the band game genre." Drake then touted the features of Rock Band, perhaps hoping to woo previous Guitar Hero loyalists to his banner. "The beat of Rock Band marches on. We're continuing to invest in the franchise and the brand that we have built, and will do our best to serve all loyal band game fans," Drake wrote. 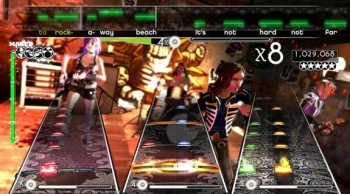 "Rock Band 3 software is compatible with a wide range of instruments, including most Guitar Hero controllers. Looking to the future, for fans that want to switch, we'd happily welcome you over into the world of Rock Band." The statement signed off with a tip of the cap to all of the people who made the music genre the success that it was. "It's been a wild battle of the bands since 2007, but we respect and appreciate all of the hard work and innovation of our peers who have shared the music gaming space with us, and we look forward to rocking in the future." You know, with the franchise that's still out there.